When I went to Osaka, Japan last November, I went to a popular okonomiyaki restaurant. WOW! They had lots of different types of okonomiyaki and I didn’t even THINK of! 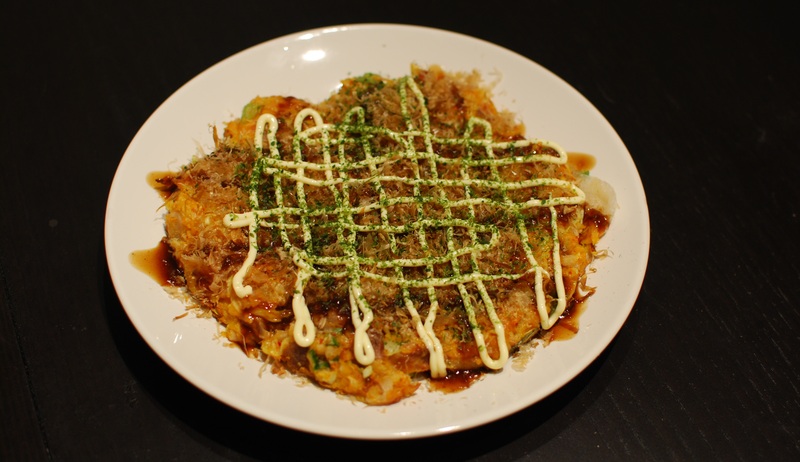 We ordered a set meal that included the 3 most popular okonomiyaki in that restaurant – house special that included 6 or 8 ingredients, Yamaimo okonomiyaki (okonomiyaki that were made with yamaimo, not flour), and green onion-pork-kimchi okonomiyaki. They were all very delicious! I was so surprised that you could use so many different ingredients for okonomiyaki. After I came back from Japan, I started trying different ingredients in my okonomiyaki. Today, I decided to try a kimchi, pork and mochi combination. 1) Mix the okonomiyaki powder, water and egg together. Mix it well so that there’s no clump. 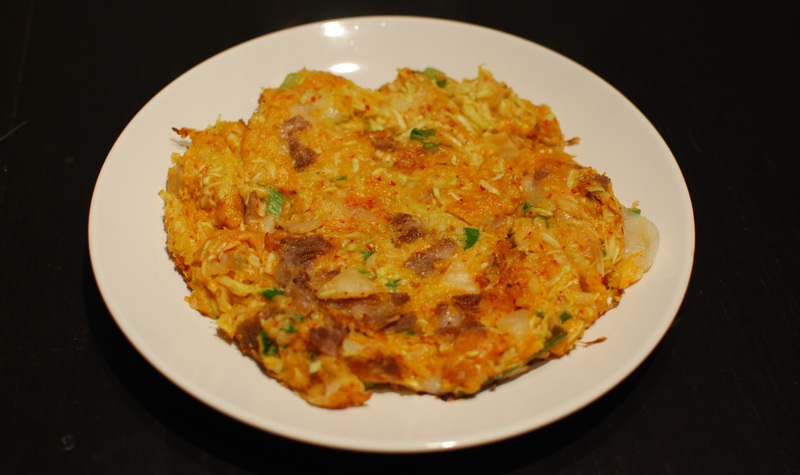 2) Put the chopped green onion, cabbage, mochi and kimchi in the batter, and mix well. 3) Heat up a frying pan and put some oil in. Then put the pork in and stir fry a bit. Put the batter in, then mix with the pork. 4) Make the batter into a round shape. Remember not to make it too thick! Turn the heat to medium. 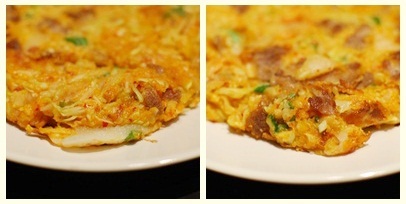 5) When the bottom’s almost ready, i.e., you can flip the okonomiyaki, flip the okonomiyaki. 6) Check if the centre’s cooked, use a chopstick/skewer to poke the centre of the okonomiyaki, if the centre’s dry, it means it cooked. 7) Put the okonomiyaki on a plate, then put the condiments on as you like. 1) Not sure if it’s because the kimchi has sauce in it, which makes the batter more watery, I find that this okonomiyaki is harder to flip. 2) AND not sure if it’s because of the mochi, which sticks to the pan when melted, it’s not easy to flip the okonomiyaki. 3) It actually tasted VERY GOOD! The mochi makes the okonomiyaki very chewy, the pork is quite crunchy, and the kimchi… I put too much kimchi in this time, Mr. Clam found it a bit spicy… I think I’ll put less kimchi in next time.